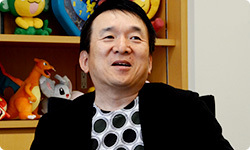 Ishihara-san, what do you think Pokémon values? I wonder… Like the other two just said, I think how interesting the games are – like game world details and gameplay logic – are incredibly important. Stunfisk, which came up earlier, became a hit product at Pokémon Centers.19 (laughs) 19: A store specialising in sales of Pokémon goods. Pokémon Centers are operated by The Pokémon Company and there are currently seven such stores in Japan. Yes. (laughs) But by making something that draws upon its flatness, like Stunfisk rice crackers, we thought, “This’ll work!” You could say that’s what’s fun about product development. When we made metal charms, we thought that a set of the three Pokémon that the player first chooses would sell the most, but actually the set with Litwick, Lampent and Chandelure was the top seller by far. At the time, you said that production couldn’t keep up. Yes. I was like, “Eh? Why?” “The store personnel said “But of course it would sell! Litwick is cute and Chandelure is strong!” and I thought, “Oh, is that so?” (laughs) One charm of Pokémon is how people come to like certain Pokémon for all kinds of reasons, because they’re “strong” or “cute”. In product development as well, it is important to discover something new and keep on inventing. Lots of people like Pokémon, but there are few occasions for thinking about why they do, so what you all have to say is interesting. And one more thing is a new feature called Pokémon Dream Radar20 for people playing on the Nintendo 3DS. We made download content specific to the Nintendo 3DS. 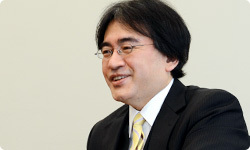 20: Downloadable software for the Nintendo 3DS system scheduled for release via the Nintendo eShop starting October 12, 2012. What is Pokémon Dream Radar like? It’s a kind of game in which you use the Nintendo 3DS system's augmented reality21 technology to . The project began with the question of what Pokémon would look like if they really existed. This may be a simplistic impression, but while the Pokémon are heading from the Nintendo 3DS system to the world of Pokémon Global Link, you imagine strange things like, “Maybe they’re passing through this world!” (laughs) 21: Technology for combining virtual data with images of the real world. Creatures22 had been looking into AR technology, and it was implemented in Pokédex 3D23, so that connected smoothly. 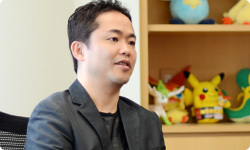 22: In addition to being involved in making Pokémon-related video games and the Pokémon Trading Card Game, this company has also developed such games as Nonono Puzzle Chailien (Game Boy Advance) and Personal Trainer: Walking (Nintendo DS). Founded in 1995. 23: Downloadable software released worldwide via the Nintendo eShop in June 2011 for the Nintendo 3DS system. It allows players to view Pokémon that appeared for the first time in and from various angles. is no longer available to download from the Nintendo eShop. That’s right. Players on Nintendo 3DS systems can not only enjoy Pokémon Black Version 2 and Pokémon White Version 2, but also download Pokémon Dream Radar and, just about one month later, download Pokédex 3D Pro.24 If they treat them like the Three Sacred Treasures25, Pokémon Black Version 2 and Pokémon White Version 2 will be more fun. 24: An upgraded version of available for download via the Nintendo eShop for the Nintendo 3DS system starting November 8, 2012. Players will be able to view information on all of the Pokémon that have appeared so far, including Pokémon newly added to and ’s Unova Pokédex. 25: A term often used in Japan to refer to three items that, when placed together in a set, become very useful. The original term stems from the imperial regalia of Japan, consisting of a sword, a mirror and a jewel that are traditionally presented to the emperor of Japan when he or she takes the throne. Yeah. You can actually bring rare Pokémon you captured with Pokémon Dream Radar into Pokémon Black Version 2 and Pokémon White Version 2, then with Pokédex 3D Pro, you can easily check info on the Pokémon you encounter as you play the two games. Editor’s note: , , and are all separate products; it is not possible to play any of them simultaneously on the same game system. Come to think of it, it’s our first time to try to bring out a new core game just before movies26 come out. 26: In Japan, the games were released alongside the movie premier for Pokémon The Movie: Kyurem vs The Sword Of Justice. You have players bring Pokémon Black Version 2 and Pokémon White Version 2 to the cinema. Yes. This time, you begin playing the game in June and then take it to the cinema. 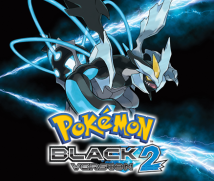 Of course, we’ve prepared it so that people who bring Pokémon Black Version and Pokémon White Version as well as those who bring Pokémon Black Version 2 and Pokémon White Version 2 receive the Pokémon at the cinema. 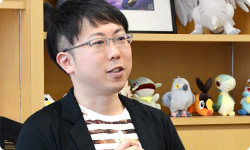 Editor’s note: Traditionally, players taking their copies of certain Pokémon games to Japanese cinemas when attending screenings of Pokémon movies have received new Pokémon via transfer. These days, working in conjunction with cinemas is nothing special but since it was unprecedented, gaining the cinemas’ approval at first for receiving Pokémon at the cinema was quite difficult. The end credits for the movie list the names of all the cinemas, but those who aren’t in the know might wonder why the names of cinemas appear in a movie. All the cinemas that cooperated are listed. It is unusual for end credits to feature the names of lots of cinemas. But that, too, is part of the Pokémon movie experience. A lot happened on the way toward making that happen, so we could talk just about co-operating with the movies for over an hour! (laughs) Let’s continue to tackle new things with Pokémon. Thank you for today.